Complete description of the Watson School Ph.D. program, including curriculum and faculty research profiles. Also includes CSHL’s education and research programs for undergraduates, postdoctoral fellows, and high school students. Summary of the Watson School’s educational and research programs for undergraduates, graduate students, and postdoctoral fellows. Includes an overview of CSHL’s extensive educational resources for scientists. Includes latest statistics on admissions, graduation, and post-graduate career paths. 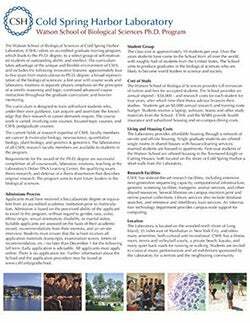 A brief one-page description of the programs offered through the Watson School. Annual student handbook including course descriptions and schedules, student support services, and program policies.